"I'VE only been here with RBA for five weeks, but so far I'd have to say this is a great job," Brenton Redshaw from Devonport, told us when we ran into him at Kempton's 24-hour Caltex Roadhouse/Truckstop Mood Food. "I've been working in the tree industry for some years, and it is so good to be back on the road again. This is definitely where my heart is," he said. "I did furniture prior to that up and down the Hume and Pacific Highways to Queensland every three weeks, and it is also really good to be home driving on Tasmanian roads again." 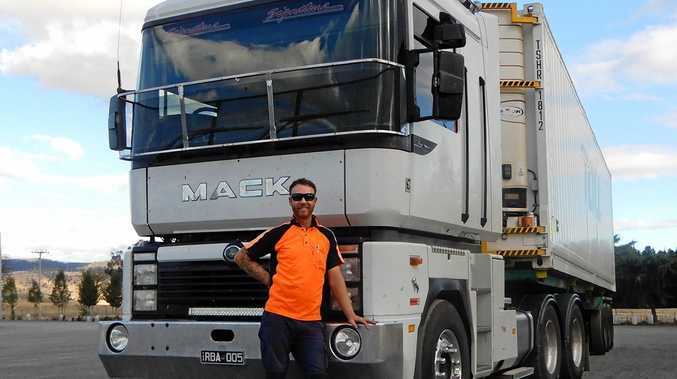 He was driving an RBA 2000 Magnum with a 600 Cummins up front, and towing a fridge unit from Hobart on his return to Burnie at the time. He added that the truck hadn't had a permanent driver for a while, and he was looking forward to getting it "up to the standard of the rest of the fleet". Asked about time off he said, in one word, that's "family".